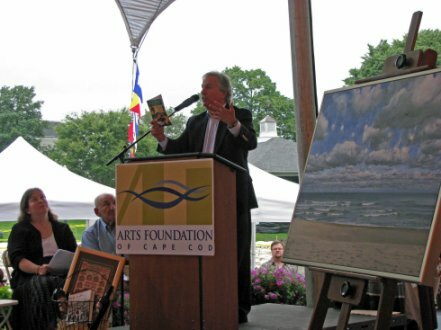 Henry Winkler, fondly known as “Fonzie” from “Happy Days,” at least among a certain age group, is a warm and wonderful person, as those the many who have encountered him on his recent trip to the Cape, can attest. He visited Sandwich High School last Friday to promote his Hank Zipzer book series: autobiographical stories about a boy who struggles with learning disabilities. Winkler, who has dyslexia and had trouble with schoolwork, triumphed because of his undaunted comic spirit and resourcefulness, characteristics shared by Hank. I didn’t attend the Sandwich event, but heard Winkler was lots of fun, reading from his books, and staying overtime to autograph hundreds of books. 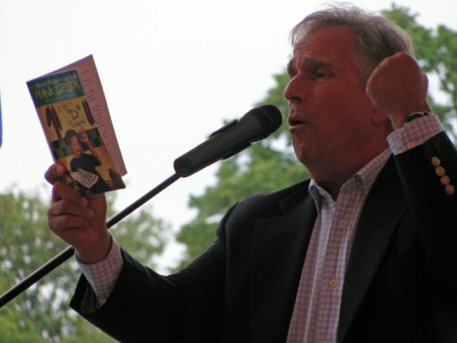 Last Sunday, Winkler appeared as the celebrity conductor for the Boston Pop’s Pops by the Sea concert in Hyannis. He conducted John Philip Sousa’s “Washington Post March” at the sold-out concert; 15,000 people attended. Henry Winker poses with the band Tripping Lily. 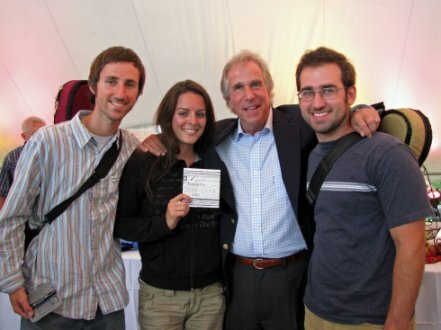 Monica Rizzio presented Winkler with a copy of the band’s latest CD. Tripping Lily performed on Sunday as part of the pre-concert activities. Also performing were the Turner Avenue Quartet from Falmouth. David McTiernan, who plays with the quartet, also played piano during the VIP reception. I met Henry Winkler at the VIP Reception and Benefit Auction for the Pops on the Saturday evening before the concert. He was friendly and funny, and he seemed genuinely interested in talking to people and patiently posing for one photo after another, even though he barely had a taste of his clam chowder or any of the many other exotic and exquisite hors d’oeuvres offered under the tent on the main stage, as the rain poured down all around us. I had bought one of his books that afternoon, at Eight Cousins bookstore in Falmouth. I picked The Curtain Went Up, My Pants Fell Down because it was about Hank’s experiences in the school play. Hank’s grades are bad (Henry was in the bottom 3 % of his class, academically), and his father does not want him to waste time in the school play, “Anna and the King of Siam,” when he should be studying. He makes a deal with his dad that he can be in the play if he gets at B+ on his next math test. With the help of a smart fellow student, a girl he has previously disliked, as his peer tutor, Hank manages to get a B on the test. A B is an outstanding grade for Hank, who is more familiar with Ds, but his stern father forces him to withdraw from the play, even though he has the lead role. I told Henry that I was reading the book and he seemed so genuinely pleased. We talked about the stories, which were based on his own experiences, and he told me that many of the people in the books were based on real characters in his life, and that his father really was that strict. Starstruck, I forgot that I actually had the book with me until a few minutes later. I wondered whether I should bother him for an autograph (no one else seemed to have any of the books or be asking for an autograph). Encouraged by a friend, I approached him again with the book, and he seemed delighted to sign it, putting his chowder aside once again. Obviously, these books are very important to him, representing a victory over his own dyslexia and giving hope to kids with learning problems. Winkler turned down initial requests that he write children’s books. He never wanted to be a writer; writing was just too difficult, and it remains challenging for him. Dyslexia never goes away; you just find ways of coping. One of Winkler’s ways of coping was by writing the series with a partner, Lin Oliver, who did the physical writing, while Winkler told stories about his life. The passage was funny and insightful. Having read one of the books, I would highly recommend them, and not only for kids with learning disabilities, but for anyone who enjoys humorous books about growing up and coping with daily life. All sorts of kids and adults populate these books: brainy kids, bullies, good pals, rigid teachers, understanding teachers, and strict parents. Winkler told us his parents used to call him “stupid.” How wrong they were. Winkler helped during the auction too, taking over from the professional auctioneer when his-and-hers Harley Motorcycle jackets came up for bid. 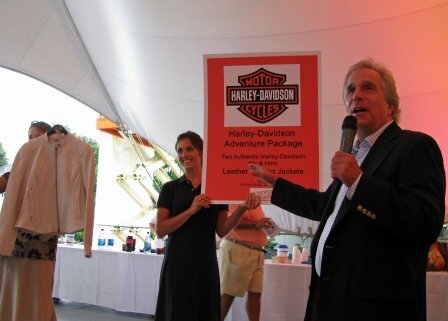 Knowing that the VIPs weren’t exactly the leather motorcycle jacket-wearing type, Winkler, whose own leather jacket from his Fonz days now resides at the Smithsonian, beguiled and cajoled the audience, pushing the bids up by offering to autograph the jackets, until they finally sold for $1,700. His big contribution came a little later when he auctioned off a set of autographed Hank Zipzer books and the opportunity to have a character in a future Zipzer book named after the winner. Bidding opened at $500, offered by Monica Rizzio of the band Tripping Lily, who wanted the character to be named Tripping Lily. It quickly rose, as Winkler charmed and coaxed the bidders, asking their names so he could personally them to bid higher, and keeping the audience laughing. Bidding finally closed at $5,000, just as one of the other bidders was prepared to go higher. Winkler resolved the problem by offering two identical prizes, bringing in a total of $10,000. 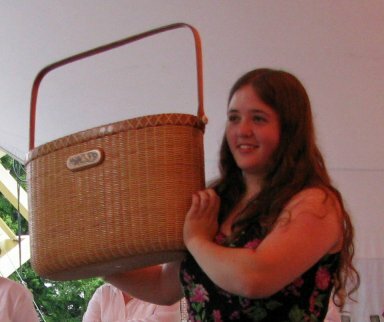 Another of the big auctions of the evening was a hand-made Nantucket basket, which sold for $2,600. Even the auctioneer was surprised at how high the bidding was going, saying at one point, “This is a lot of money for something that will sit by the toilet and hold Sports Illustrated.” He later suggested it should go in the guest room, asking, “What the hell is in this basket?” When the bidding finally ended, the auctioneer announced that the basket-maker, who was at the auction, would make a second basket to that the two highest bidders could both receive a basket. “You should have mentioned that earlier!” said one of the winners. The big item of the evening, the Pops by the Sea painting, “Sea Notes,” by John Friedman, was auctioned off for $13,000, and two signed lithographs went for $500 each. The painting is a beach scene, showing eighth notes floating among the clouds. Other items included four box seats at the Red Sox-Toronto Blue Jays game on August 17 for $1100, tickets to the Tony Bennett concert at the Melody Tent for $900, a lithography of Edward Kennedy’s boat Mya, to be signed by Senator Kennedy himself, for $2,300. All told, the auction brought in $42,800 (by my calculations, which do not include numerous $100 contributions) for the Arts Foundation of Cape Cod. The audience had been advised to “bid with reckless abandon; this is not about saving a few dollars, this is about philanthropy.” The bidders had the right spirit. And a good time was had by all. Perhaps, but we would all much rather have Henry Winkler do it. 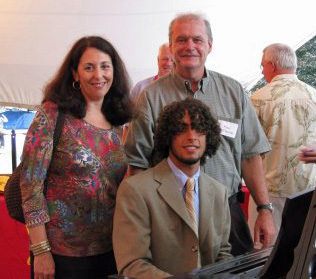 Rising Star: David McTiernan provided piano music during the reception. He is shown here with his parents Judy and Paul McTiernan. David attends New York University; the family lives in Falmouth.